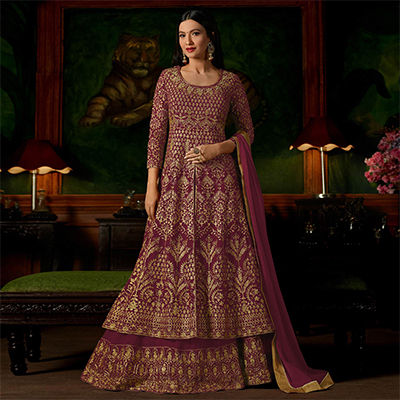 Be the sunshine of everyone’s eyes dressed in this maroon colored desinger lehenga anarkali salwar suit showcased by Gauhar Khan. 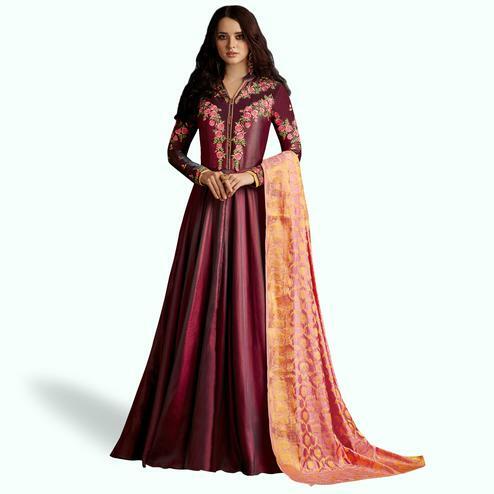 The pretty heavy embroidered, lace, stone work across the attire is awe inspiring. Available with matching santoon fabric bottom and chiffon dupatta with golden lace border. Specially designed to wear for wedding functions, receptions, engagement ceremony and family occasions, where you want to be center of attraction. Team this suit with classy accessories and high heels for a complete look.